Developing the history for the world you’re creating is probably the aspect I have the hardest time with. But it’s also very important. The history of your world sets the foundation for events happening currently in your story. While you do not need to have every tiny detail of your history hashed out, you should have a general idea of what took place in your world before your story starts. For instance, if you choose a dystopian world, you should have an idea of what took place for the world to reach that point. If your world is magical, were there any significant events that took place that were caused by magic? Is magic accepted or feared? Harry Potter and Merlin both have magical settings, but very different reactions and understandings of that magic. What type of world do you have? How did it reach that point? Were there any major events that took place prior to your story? Are there any historical figures who could impact the story or characters? How has your world developed since the beginning? How long ago was your world created? Five years? A hundred years? Five thousand years? If you world did have significant events prior to your story, how long did they last? These questions are important to address no matter what type of world you are creating, though they are especially important in a fantasy world. Your fantasy world is entirely your own and your readers have no knowledge or information about it. It is entirely up to you to show and explain what has happened prior to the story so they will have a reason to care about what is happening in your story’s present. Now, like I said, it’s important to develop the history for your world, but it doesn’t have to be done all at once. Significant figures will also be developed through the creation of people for your world. The layout and geography may be affected by certain historical events. Technology you have may depend on how long your world has existed. All elements of worldbuilding are intertwined. This was a short one, but like I said, creating the history for worldbuilding is an aspect that even still confuses me a bit so I didn’t want to include too much here. Worldbuilding is a pace you have to set for yourself so we’re really just covering the basics here. Usually I’d only post one of these worldbuilding posts once a month, but since I’m just soooo good at keeping on top of my own schedule (can you hear the sarcasm? ), there will actually be another of these posts up tomorrow! I’ll be talking about people and the different types of people and figures you might want to consider for your world. Let me know what you thought! Are there are questions you ask yourself when developing history for your world? Is there are certain aspect of worldbuilding you struggle with? There are tons of blog posts out there that talk about world building. There are entire books that discuss the different aspects put into creating your own fictional world and all the intricacies of it. So naturally, because it’s been done so many time before, I decided to add to the madness and give you my thoughts on world building in this new series of posts. World Building is still a process I’m figuring out for myself so I thought through these posts I could share with you what I’ve learning about the different elements of creating your own fictional universe. The first and most basic step is deciding on what type of world you’re going to have. Is it a dystopian world? Utopian? Conformist or evolutionary? Medieval or fantasy? This is the most basic thing you need to determine because the type of world you’re creating will literally affect every single thing you write and decide for your story. If you’ve got a dystopian society, the world you create isn’t going to be bright and colourful. It won’t be full of rainbows and people won’t be skipping down the streets. It’ll be dark and gritty and you’ll use a thesaurus to find every variation of the words “dark” and “gritty” to describe the setting. On the flip side, if the world you create is a utopia then there probably will be rainbows and skipping involved. Your characters will probably be happy with their lives and things will seem good. Now obviously neither of those descriptions are set in stone and there is always the possibility of a light at the end of the dystopian tunnel or of a dark underworld side in your utopia. But you get the general idea. Choosing the type of world is just the first step in world building. It’s the first layer of a very elaborate cake. It’s the base for many different things that will happen in your story and happen to your characters. The world you build does not have to fit exactly in to description box of the world you choose. But you can’t choose to have a totally normal story and then, five pages before the end, a dragon suddenly appears and eats everyone. I mean, sure, that would be really cool, but it’s not really plausible when the rest of your story was set in a normal, average, every day town where, previous to those last five pages, there were no dragons. And if you do choose to do that, you better have a really cool sequel lined up and ready to go. Now, as I said before, this is only the first step. There are so many other aspects to world building that turn it from an idea into an actual thing. The people, the history, all the stuff that doesn’t necessarily make it into your book, but is still so important to your story. In the coming months I will be talking about world building and the various things that go into it. If there is anything you would like talked about or anything you would like to add let me know down below! And let me know: is there a type of world you prefer writing over others? Do you prefer a fantasy universe? A dystopian world? The possibilities are endless and I want to know what you think! The answers to these are: My job is writing, no I’m not a journalist, and it means I spend hours on end staring at blank word documents willing something magical to happen while consuming unhealthy amounts of caffeine. I’ve talked to other writers who have said they’ve had similar experiences. And while I get that being a writer could mean most things, if someone introduces themselves as a doctor, do they get asked what their real job is? Hint: probably not. So why does it happen to writers? It actually took me a really long time to say “I’m a writer” and not “I want to be a writer”. I always thought that I couldn’t really say I was a writer until I actually had something published. I used to hear people say stuff like this, like how you can’t say you’re a doctor just cause you’re in medical school. But that’s not quite the same thing. I write. It’s what I do. It’s what I’ve always done and what I will always do. I’ll probably die with a pen in my hand and an unfinished story in my head. I call myself a writer because that’s what I am. What is my real job? Writing. My real job is writing. I’m not published yet, but one day I will be. Then, when those people ask me what I do for a living, I can very proudly call myself an author (this is probably a word that will invite less questions than writer). So when you tell someone you’re a writer and they ask what your real job is, bear with them. Rage internally, but just smile and nod and explain to them what it is you do. Believe me, I know how frustrating it can be to not have your job taken seriously, but just imagine the looks on their faces when one day you’re published, whether it’s a book or a magazine or whatever it is you want to do. Imagine that look and you’re golden. 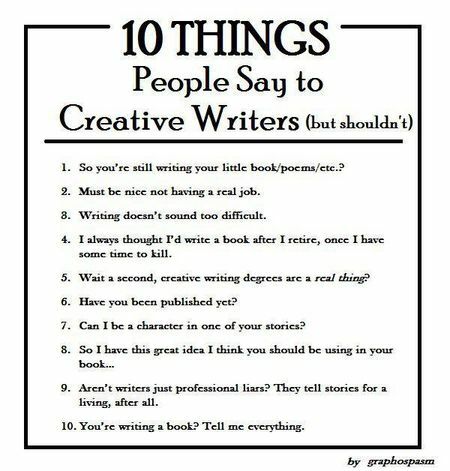 Now, by the off chance you’re reading this and you’re not a writer, here are some things NOT to say to a creative writer. Have you had a similar conversation with someone? What did you say to them?